The PB-5003-5M is a surface probe with a 5m cable which monitors temperatures from -40°C to +125°C. Its adhesive sensor makes it ideal for monitoring surface temperatures of pipe work. It is also typically used for profiling of product cooling curves. 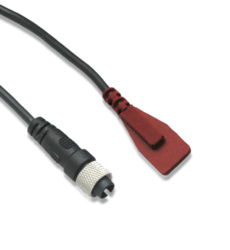 This probe is also available with a 1.5m cable (PB-5003-1M5) and a 3m cable (PB-5003-3M).